With only a week until Thanksgiving here in the US, what better time to think about food photography? 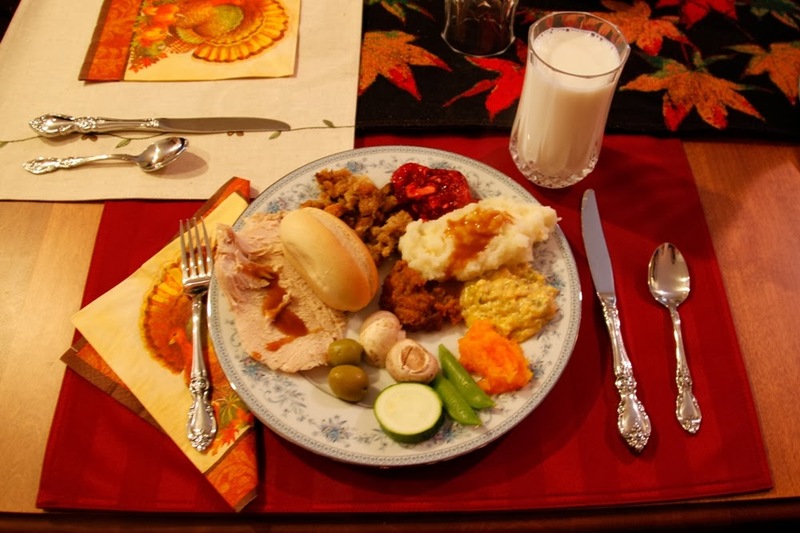 Thanksgiving meals offer a vast array of colorful and meaningful foods to photograph, but the tips in this article are useful for all meals of the year. 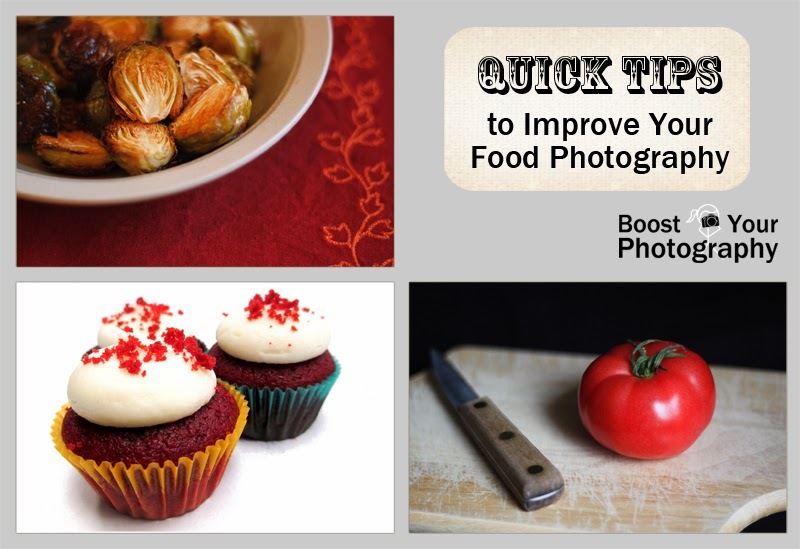 Most home kitchens have big, bright windows for a reason: to improve your food photographs! (Ok, so maybe there is more than one reason.) Natural light brings out the bright, normal colors in your food and avoids the potential odd color casts of indoor lighting (the yellow or fluorescent tones, for example). 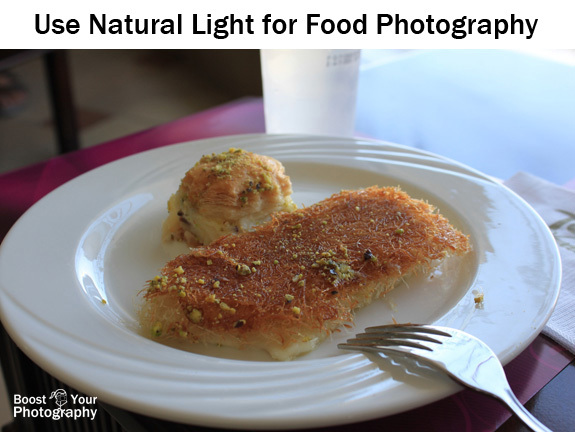 Bright, diffuse light can make the whole scene look more appetizing, like in the photograph above. This type of light happens when the sun is high and bright in the sky, so it is not shining direct light into the scene or creating harsh shadows. The light seems instead to come from everywhere and lights the scene more evenly. Direct light and shadows can be used for food photography, like in the example below, but it has a very different look and feel. 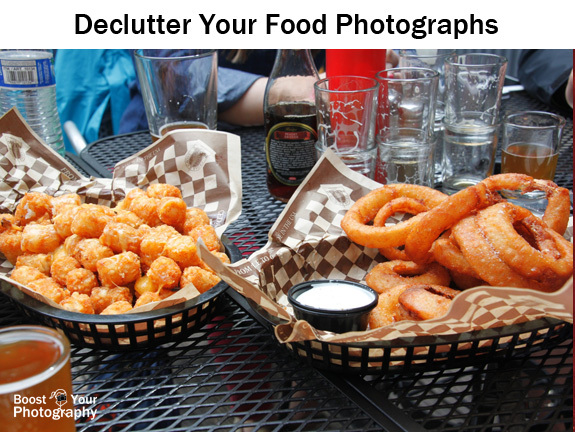 The background can make or break your food photographs, which is especially difficult if you are taking a picture of your food in a restaurant and have less control over our surroundings. This photograph is certainly more documentary than artistic, though it does capture the tastiest onion rings I have ever eaten … ever. (The Skagway Brewing Company in Skagway, Alaska is worth the trip for the onion rings alone, but the beer is fabulous too.) While the empty tasting glasses in the background could be said to add context to the image, in reality they distract the eye from the subject, as do the bright blue and red colors of the people and ketchup in the background. One way to avoid background problems in the first place is to get in close. Filling the frame with your subject will keep your viewers attention firmly on the food. It also serves to simplify the composition and remove potential background clutter. Getting close also makes it easier to create a high key white background, like in the image below. These mini cupcakes were placed atop a blank white piece of copy paper and quickly photographed before the rest of the staff gobbled them up! Natural light from the window behind added to the overall look. These delicious cupcakes came from Capitol Bakery in Madison. This tip is helpful whether you are planning to get in close or take a wider shot. 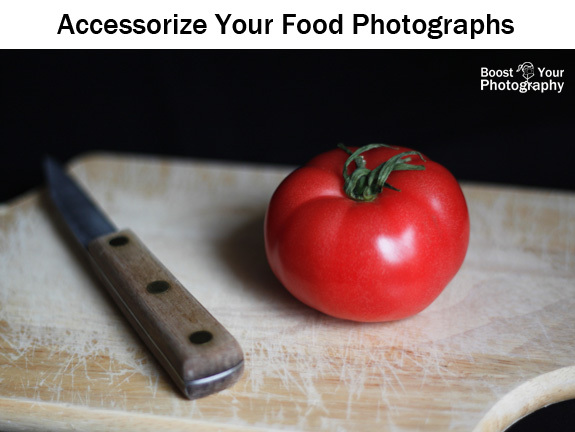 Consider accessorizing your food photographs. For close-in shots, this can be as simple as a decorative placemat or a piece of scrapbooking paper. For the Brussels sprouts below, the red colors of the placemat and the leafy design lend an autumnal atmosphere as well as a great color contrast with the greens of the bowl and the sprouts. For wider views, consider the rest of the composition and background. Where are you placing the food? Is it a countertop, a table, etc.? Consider using decorative linens, tablecloths, napkins, or other accessories. Do not forget about utensils or cutlery to complete the scene. 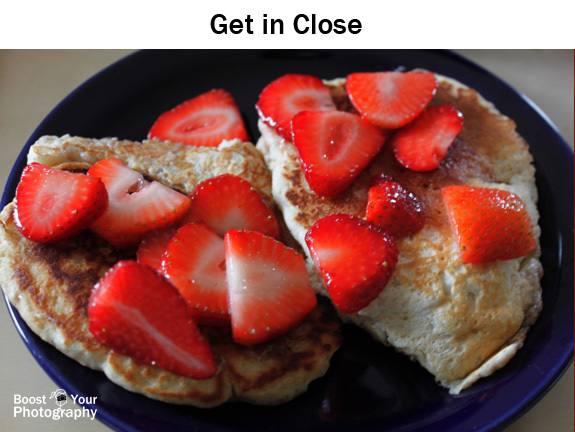 Many food photographs are shot using a wider aperture. A wide aperture gives a narrower depth of field, allowing the background and the food itself to quickly fall out of focus. 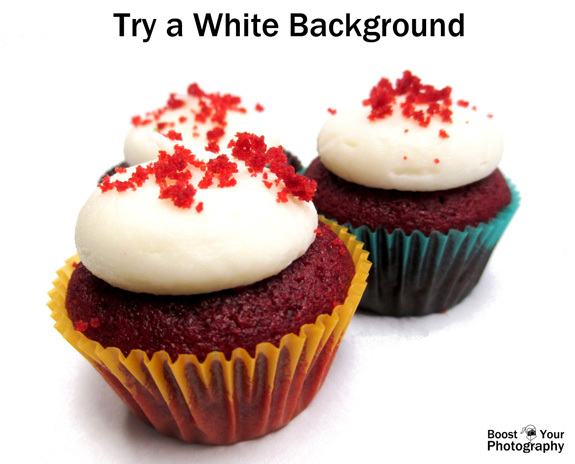 This has the double benefit of helping to de-emphasize the background and to add a softer look to the food. In the photograph of the cake below, it is the mint leaf that is entirely in focus, but even the chocolate behind is beginning to fall out of focus. Read more about What an Aperture of F/1.8 Can Do for You. You can make your food photographs even more involved by trying to tell a story or capture a process. Think about the wider setting or context for your food and use that to your advantage. The catered breakfast featured above would have looked quite bland in an up-close image. Then the focus would be on the clear dish cover and the plastic wrap on the orange juice. 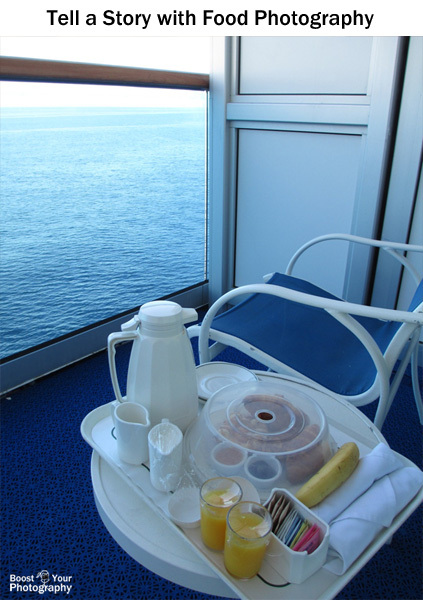 Set in the broader context, on the balcony of an Alaskan cruise, next to a lounge chair with a view of the ocean, the focus is now on the setting and the overall story of breakfast room service. You can even take a series of images to tell the story of the creation of the food. This series documents the making and baking of my favorite Irish soda bread recipe (found here if you are so inclined). 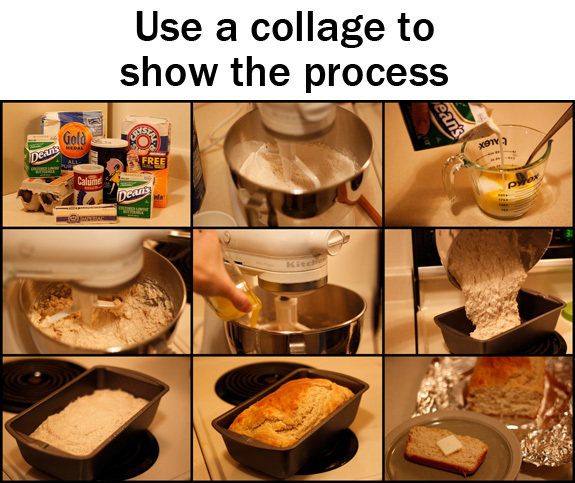 Here, the plain white backdrop of my kitchen serves to help simplify the individual images and to unify the overall collage. 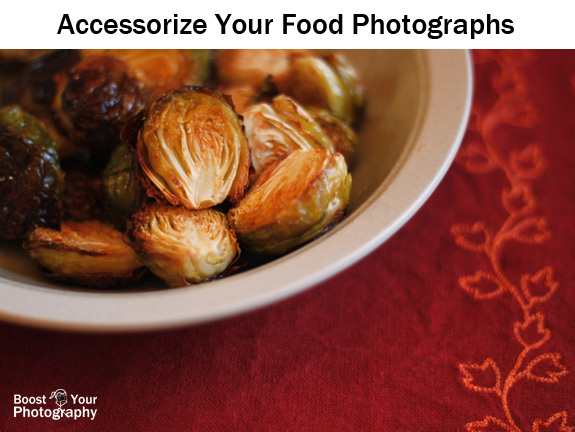 Food photography is a fun and easy way to showcase your own cooking or a favorite meal out. A little bit of planning (using a bright window, changing your angle to avoid a distracting background, or accessorizing with a quick piece of paper or a placemat) can make big a difference in your final shot. And don't forget to stop and capture your Thanksgiving feast too before you dig in!